Are you familiar with tapas? These are little appetizers invented in Spain that people enjoy while talking and drinking in the cool of the evening. What makes them so great is that you get a wide variety of tastes without getting fed up. Community moderators have access to a page that includes several interactive charts showing time series of aggregate data such as traffic, posts, page views, and even newsletter subscriptions. Much of it can be cobbled together via public sources, such as SEDE, but not all of it and not all in one place. Traditionally we haven't shown this data to non-moderators because there's not a lot people can do with it. But there's no reason users with X reputation couldn't have access to those statistics. Conceivably, it could even be useful for community leaders to have better data about their site's history collected in one place. More importantly, however, it's an amusement people could look forward to earning. Not cause any problems for other people using the site. What tasty dish would you like to serve to high-reputation users? * Quite a few of the 30k suggestions are moderator privileges which mean you get to do something that, in turn, could become an obligation. This is one of the things that makes me uncomfortable about giving 30k users the burden of moderating comments. Currently, these are only available to moderators. This is a feature that I miss dearly on sites where I'm not a mod. This would also allow users to view a list of all their own deleted posts (search deleted:1 user:me), essentially making it a more powerful version of bluefeet's request. Give users a place on the profile1 (Profile rather than Activity; this is outward-facing) to collect, say, up to 10 posts that they're most proud of or otherwise want to show off. Sometimes your best work isn't high-scoring (maybe it's in an obscure, low-traffic tag), or maybe you just think everything clicked on that post and you want to show it off a little. Ideally you would be able to click on an "add to my list" control next to any of your posts (with a warning if you're already at the max number). But if that's too hard, a place to paste in a URL to add it to the list would be ok. It'd be nice if you could change the order, but that's not critical; I'm imagining a list short enough to easily browse, after all. This idea was inspired by the part of the Careers profile where you can advertise selected answers from across the network. (And I imagine reusing some code from there.) 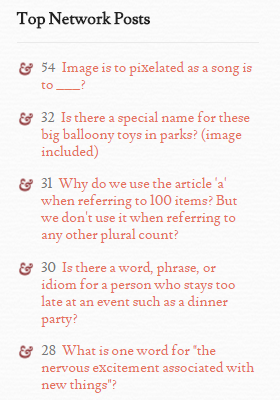 My proposal includes questions and not just answers, because a well-asked question can be a thing of beauty too. And my proposal is tied to a particular site, both selection and viewing; I see this being about "my best work here", not "my best work in a job hunt" or "my best work for all viewers in all contexts". This list you see now contains up to 10 items, which is why I propose up to 10 "picks". That would use the space already allocated to showing a selection of posts. Implemented for 25k users on graduated sites and 5k users on beta sites. I absolutely love the example suggestion. So here it is so that it may be voted on. This seems like a useful addition to search. I don't know if it makes sense to limit this to any particular reputation level however. If we do index comments for search, we might as well let anyone use the feature. At the moment, we are using a version of Elasticsearch that makes mixing commments with posts difficult/impossible. It's possible that when we upgrade to 2.x this feature could be implemented. But that's a ways off. So I'm declining this feature request until then. Often enough to be frustrating, I remember either seeing or making a comment that I'd like to find again -- a helpful reference, a well-written comment that I'd like to use as a template, something involving weaponized unicorns that made me laugh out loud, whatever. If I know who posted it I can painstakingly dig through the "actions" tab from a profile, or I suppose I could try to find it with the LIKE operator in SEDE (if it's old enough). But why not make that easier? Comments are second-class objects for good reasons and aren't indexed by Google generally searchable on-site, but I don't see the harm in making it a little easier for established users to find them. I don't mean mingling comments with posts in general search; that could produce a lot of noise. I mean supporting a directive like is:comment (to go along with is:question and is:answer) to search comments intentionally. On occasion, I'll run in to someone referring to my questions or answers out "in the wild" -- kind of neat! It isn't easy to get at that kind of information without manually searching Google; as a privilege it would be awesome to see a list of inbound links to things I've posted (including questions on SE that were closed against mine as a duplicate or links from comments). This is a subset of analytics data -- referrers other than Google. It would also be cool, and in the same vein, to see a list of top Google search terms that lead to my posts. These data points don't add any special functionality, or introduce a capability that could be considered a burden. Just a little sop for ego, and possibly a way to join conversations elsewhere regarding a subject that you've dealt with, either as answer author or as a frustrated developer who posted a question. Thanks for considering adding a new privilege! You can use this feature by using search deleted:1 user:me. I love the idea. But I'm afraid that high reputation users are not immune from being annoyed by their deleted posts (either because they love them and wish they were undeleted or hate seeing the follies of their past selves). If anything, I'd rather lift this restriction for everyone than make it a privilege. From our profile page for questions and answers, we get access to the recently deleted content, stuff deleted in the past 60 days. I propose removing this limitation and allowing us access to all of our deleted posts. Currently, only a small number distinguishes a top user's flair from any other. New flairs, available only to high reputation users, could have a more elaborate design, with color pattern emphasizing value (compare to credit cards: gold, platinum, etc). Let me preface this by saying that I've never hit this limit myself. I have hit other rate limits that are annoying, so I'm imagining what it would be like to hit this limit fairly often. To be candid, I don't think chat moderation tools are ready to handle problems of annoying, but not exactly abusive behavior. Personally, I'd rather people post full thoughts in a single chat message and slow down a bit. I believe that's part of the reason for including this limit. We already trust anyone with enough reputation to chat to post two messages in succession. Nothing bad could come out of that. But allowing people to post three messages in a row? Three whole messages?! Just think of the unspeakable evil that could come out of that!! In all seriousness, hitting the rate limit once every ten messages is extremely annoying, especially when I can hop over to, say, IRC, and post messages without restraint. We already have a flagging system, which should take care of cases of users abusing the system by posting many useless messages in a row. A gradually reducing rate limit as you gain rep wouldn't cause too much harm and would make many chatters' lives much, much less painful an- aaahugguhghghugh what do you MEAN I have to wait TEN MORE SECONDS just to finish a complete thought?!!!??! I find the topbar notifications very compelling; it's difficult to let them sit unclicked. My amateur behavioral psychology suggests that only showing positive changes is a big reason. It's not that this idea wouldn't be useful. Rather, it works against the original purpose of the feature: engage users when they do positive things on the sites. For a subset of people (even high-reputation users) the aggravation seeing the occasional downvote displayed prominently would be a turn-off. Big kids don't need the truth hidden from them. I'm (relatively) not that active on Stack Exchange, but I've engaged in email correspondence with other users. I use email because, unlike chat, it's not public and it encourages in depth messages (e.g. no length limit). I use a gmail account when I do this. I might be an anomaly, but I suspect that this would be useful for a lot of people, especially moderators (who might use it to email people to ask them to promote the site). It would be really cool if Stack Exchange would give moderators and/or high-rep users a @sitename.stackexchange.com email. I don't know how hard that would be to implement, but it would be a really cool feature for the small subset of users who use email. So I think showing deleted posts that you commented on will encourage useless (or barely useful) comments on deletable posts. If you are just commenting, you don't have any special stake in a post. (Now an edit, might be a different story.) For deleted questions you've answered and deleted answers to your question, I can see some value. I'm debating whether to decline this idea, but I think there's a possibility it might help more people than it bothers. The cases I'm most worried about are outrageously offensive answers to a question that stick around to aggravate you forever and encouraging people to answer bad questions rather than downvote them. There are ways around this (don't show posts deleted as offensive, for instance), but it starts to get complicated. So I'm going to think about this idea a bit more. I sometimes want to check the progress of my efforts to improve posts by editing, teaching the poster on using the site or asking the poster about specific unclarities. On sites, where I have not reached 10 k, if the post got deleted, this may result in me searching for a while and just not finding it, which can be quite annoying. Thus it would be nice to be able to see deleted posts, on which I participated in some way. See deleted questions (and answers to them) if you posted an answer to the question yourself. This is particularly annoying if I post an elaborate answer to a question, which then gets deleted for no apparent reason (e.g., by a user misunderstanding the system). In this case, I have no easy means of salvaging my answer. See deleted answers to your own question. If an answer gets deleted, this is usally for a good reason. But if you ask a question, it’s sometimes useful to have an overview of the whole story. See any deleted posts on which you commented – for the general reasons described above. It's to be hoped that the user posts high-quality, relevant links. If they begin to spam there are other (more severe than adding 'nofollow') ways to deal with that. See also Can we not rel=nofollow links in profile About Me for users with 3000+ rep? See also Stackoverflow amongst nofollow web abuse sites (caveat: this seems to me an interesting point of view on this subject however I don't know whether it's true). The main (only?) reason that view vote counts is a privilege and not open to anyone is server load. I find it very irritating that I can not view vote counts on sites I've not (yet) reached 1,000 reputation, which is quite much. I suggest that users who have ever reached some threshold (4k?) on some site, get the ability to see vote counts on any site. This would just be some checkmark that is ticked on and never ticked off, like the association bonus. This would only cause a small extra server load, so that should not be a problem. The ability to see your deleted comments. I've had a few times recently when I go back and look at a post and think, "I should add a certain comment to this", then think, "but didn't I already do that? ", and "maybe it's been deleted", and "But if it has been deleted, then I can't see that it's been deleted", so "I guess I won't add that comment, since it will only be deleted again". The high rep-users are regularly online, and find plenty of really good or really bad posts to vote on. As a result, they frequently run out. Higher rep users should have many more than 40 votes per day. I frequently use all of my daily votes, and I am sure there are plenty of other users that would also enjoy more daily votes. Except that the shape would be like tags and not so square, I grabbed that from my "next badge" list on my profile. I would want this for all three colours of tag badge. It would be a fun reminder of the tag badges we have (too expensive for everyone, but there are fewer high rep users) and would take care of reminding me about the dupehammer while we're at it. Right now you show 4 ads, two inline, and two sidebar for new users, or users with under 200 reputation. At 200 reputation you remove the inline ads, leaving two sidebar ads. Consider removing one sidebar ad at some level (10k? 50k?) and the second (ad-free!) at 100k or 200k. This will probably not alter your bottom line very much, and it will increase high-rep user engagement, since the related and hot network questions will now appear above the fold, enticing the high rep user to stay on the site and contribute more content. If you can't get rid of the ads altogether, perhaps moving them further down in the sidebar as reputation increases would be sufficient. Are in tags I've either marked as favorites or answered a lot in (so odds are that I'll be interested). Don't have good answers already (so odds are there's room for me to help). Sweet, I have 15k, I have a new privilege! Huh, what's a protected question? Hmm, ok. Let me go find a question to protect! Pfff, that's disappointing. I waited so long for this privilege and it's basically useless! Most of the existing privileges have an effect that's visible immediately. You can observe them passively or quickly find a way to use them, at least if you participate in activities other than asking and answering. 100 and below: at this stage, with the discovery of new features, pretty much anything is new. Commenting at 50 makes a huge difference. 250: view close votes on your own questions. A common source of disappointment because it's often mistaken for “view close votes on any question”, due to the description. 1k: click on the score and see the breakdown. 2.5k: honestly, who knows about this one? And even if you do, tag synonyms without moderator intervention are kinda mythical. But it's between two privileges that are relatively close, not like the fairly long droughts between 3k and 10k or between 10k and 20k. 3k: new close button on questions, reopen ability, close review queues. 5k: much more minor, but you'll start seeing tag wikis to review. Still a bit disappointing. If you're going to add more privileges, please make them substantial enough. It should be a feature that can be experienced immediately, or at least soon after getting the privilege. It doesn't have to be an important feature, it can be a cosmetic one, but it should be one that lets the user validate their accomplishment by doing or seeing something. The idea is a really good one. The problem is that making it work would require pulling in more features that have baggage we probably don't want to be burdened with. In particular, if you can edit comments, it's important that someone be able to track changes. The five minute window means there's not much opportunity to mislead people with edits. But if I can go back years later and edit a comment, it'll be easier to grief other users or sow confusion. At the moment, not even moderators can view comment changes; it requires access to the live database. In addition, it turns out that late comment edits are less tempting than you might imagine. I rarely use it. Regular users can edit their own comments for about 5 minutes, then editing is disabled. I suggest you remove that time-limit. This is not a big privilege, but you did ask for a "micro-privilege". Add the ability to search for posts that have close votes (or don't have close votes) and delete votes, using all the other power of search parameters. I don't think people having the ability to do a search closevotes:4 [mytag] would become an obligation. Also, searching in the reverse (closevotes:0) would really help a lot in tag cleanups "search for all questions in this tag that aren't yet in the queue" Stack Overflow Example. Programmers Example. The system will automatically delete unlocked, unanswered questions with score of zero (or one if the owner is deleted), fewer than 1.5 views per day on average, and fewer than two comments after 365 days. Rationale: If you managed to reach a high reputation, your questions deserve the benefit of doubt for being remotely reasonable. Thus, if they match the above criteria, they are likely to be difficult-to-answer questions on a topic so niche that people do not even look at the question. Moderators often get a message whether they want to unfreeze a chat room. I propose that users beyond a certain threshold can unfreeze auto-frozen chat rooms that were freezed less than two weeks after they want to unfreeze the room. Since it are mainly high rep users who talk in chat, this is an useful feature. The recent requirement might be removed but I think we should keep things in control. This is an extension to the view vote counts privilege. If you have this privilege, you can, after clicking vote counts, click another time to see the number of anonymous upvotes and anonymous downvotes. 1 People who are not logged in, or have <15 rep or <125 rep in case of a downvote, change the anonymous score when voting. This is something that already exists, and the posts with the highest anonymous score were also included in the 2015 report. Personally, I currently have well over 100k network-wide, over 10k on three different sites, over 3k on another eight sites, and over 2k on another two sites. I currently have diamonds on two sites, and have had one on another where I left in good standing. And still, there's a gazillion sites where I can't be trusted to fix a simple typo in a post without jumping through hoops. If a user has earned a large amount of reputation on one or even a few sites, it's a decent bet that they know reasonably well how things work. So if they come across typos or other small errors in posts on sites where they haven't earned enough reputation to be able to make edits without community review, at least waive the six-character minimum for edits, but keep the requirement for community review in place. If the edits are rejected in community review for being, say, not constructive, then this should trigger the proposed-edit ban already in place. The threshold for triggering the proposed-edit ban could be lowered if the user is exercising this privilege. Users are allowed to have some number of pending suggested edits at a time; I think half a dozen pending suggested edits is allowed, but I could be wrong about the exact number. There's no reason why a user exercising this privilege couldn't have that threshold lowered, even to just one suggested edit at a time (so the proposed edit must be fully reviewed before they can make another edit proposal to another post). Both of those (seemingly fairly small) changes would reduce the impact on a site's community of a user making small edits that are somehow out of place, and certainly don't appear unreasonable to me at first glance. Yes, there are ways to trick the character bean counter. I'm arguing here that at some point, tricking it shouldn't be needed, iff the edits are constructive. Yes, this means that reputation will carry meaning across sites, which may be a non-trivial change. So there's probably a decent chance that this won't get implemented. Still, it would be a very nice gesture toward people who spend a lot of time contributing on other sites, and just happen to come across somewhere they can make a small adjustment that improves a post. It's understood that per-site metas don't have their own reputation, and therefore bounties cannot work as elsewhere. But it's also true that important, difficult issues can get covered by a stream of burnination requests or duplicate support questions. I propose that a user with very high reputation should be able to promote one meta question per month on the meta of their site. In other words, they should be able to pick one question from the meta site and promote it. The promoted questions would be placed on the featured tab of the meta site, analogous to how bountied questions are promoted on the main site. (They should not automatically go into Community Bulletin, though -- that should be up to voters, as in present.) There would be no reputation spent, and no payouts. A while back I circulated an idea internally to let everyone see display name changes. The complication is that we don't know why people change their display names and sometimes they might have very good reasons to conceal their identity. Obviously it's still be possible to connect accounts to old accounts if you dig into comment replies and such. But it seems like a user has a reasonable expectation that old display names will remain private if they haven't posted anything with them. Giving this information to moderators is not a problem since they are bound by the moderator agreement. Making the information easily accessible is probably not a problem when it's possible to find the old display name on the site associated with the user. But figuring that out is complicated and error-prone. Our developers told me that it would be easier to block people from changing their display names instead of my scheme. So while I love the utility of this proposal, I don't think we can make it happen. The ability to see all of a user's past display names/aliases. Reference this popular feature request (and many others). We do have this information, and we can expose it. But the user page is quite busy already and needs a redesign, so I am not sure exactly when we will get to that. Close votes not to "time out" for double the normal time. At least in tags the person has lots of rep in. Close votes to be "promoted" in the close review queue, so they are more likely to be acted on. This is an offshoot of another answer here: show off the posts I'm most proud of. But that's primarily a function of site traffic, not where I spend my time or what I am most proud of. Allow that a particular site's posts be hidden from in the list. So I could hide all ELU posts. Note that this is different from making ELU private: I don't mind if people know I am an ELU user, I just don't want its posts dominating my list. Give me a list of posts to select from that meet some minimum vote threshold. And override the behavior where the current site's posts are ignored in the calculation. Not the answer you're looking for? 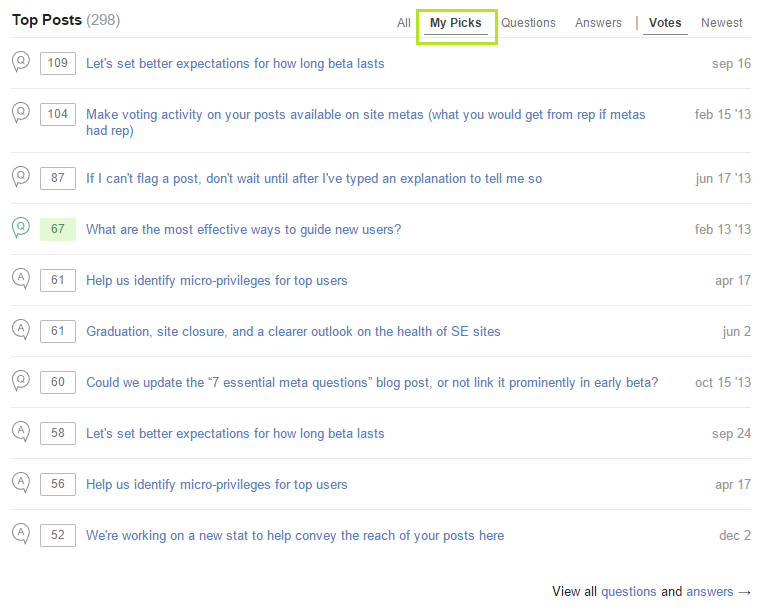 Browse other questions tagged feature-request privileges . Is there a way to edit a question without bumping it to the front page? Does SO need social networking features to improve the experience for expert users?